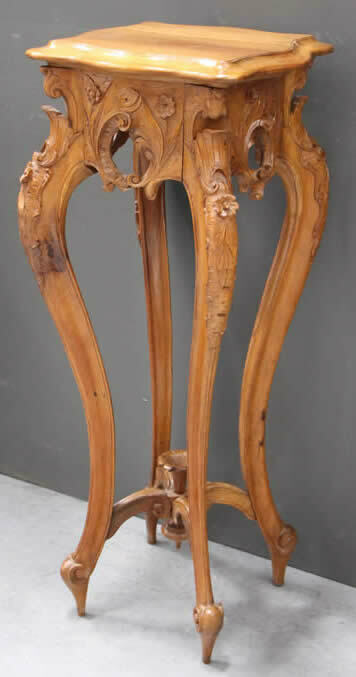 Antique solid carved wood rococo stands. 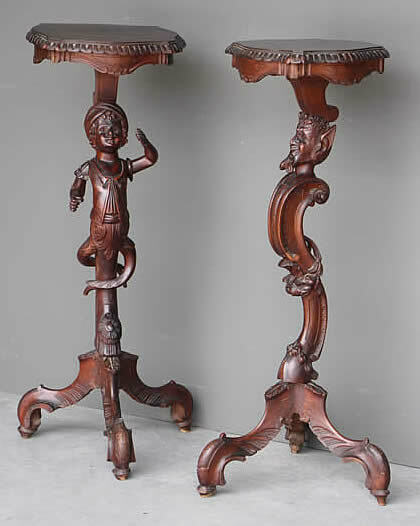 Rare pair of antique Italian Venetian pair torchere stands 19th century ornate carved rococo. 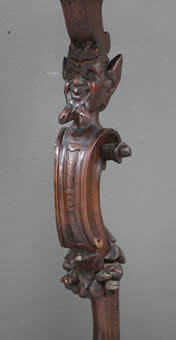 Profusely carved with ornate scrollwork cabriole legs and rocaille bases. 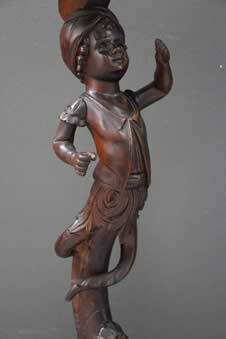 One stand with turban top blackamoor the other with Ancient Roman faun, complete with hooved foot base. 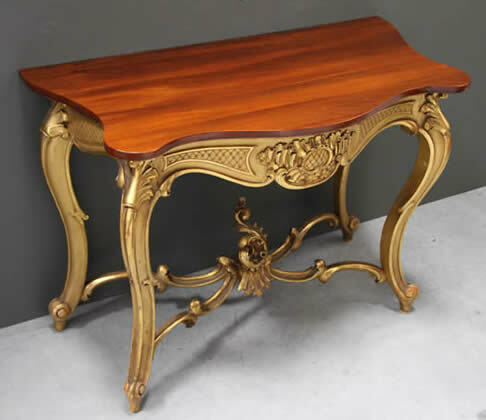 These are good solid stands or pedestals with a serpentine shaped ornate carved tops . 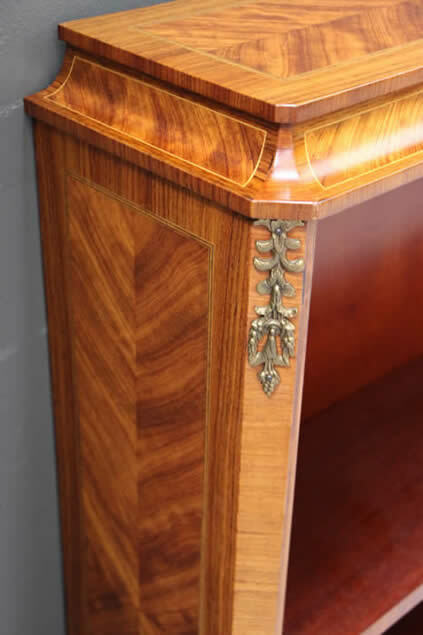 Amazing details to the carvings and all executed in solid fruitwood with a walnut stain. 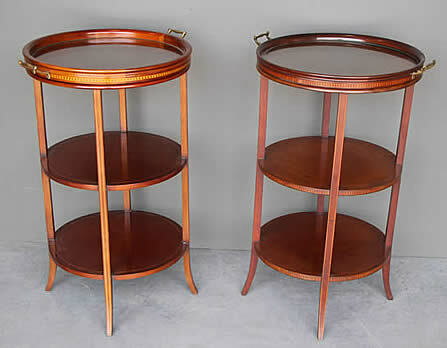 A gorgeous matched pair of Sheraton style English mahogany three tier etagere or wotnot stands, ideal as bedside tables they come complete with glass tray top. 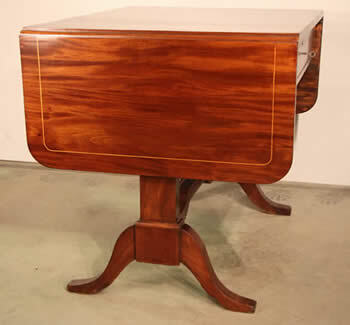 The mahogany with satinwood string inlay and with rosewood marquetry border. 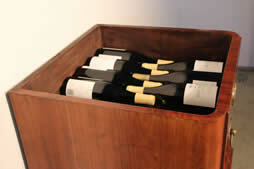 The lift off tray top with glass surface protecting the delicate inlaid tops and with original brass handles. 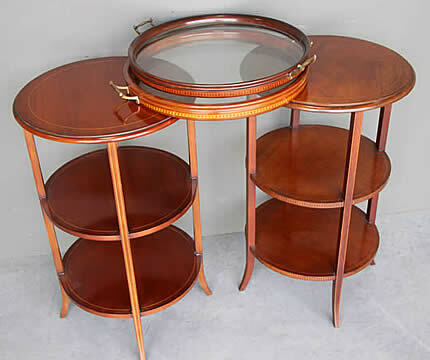 All three circular table shelves or platforms with satinwood string inlay to shaped legs. Superb English craftsmanship and patina. English early 1900's Edwardian period in the 18th century manner. 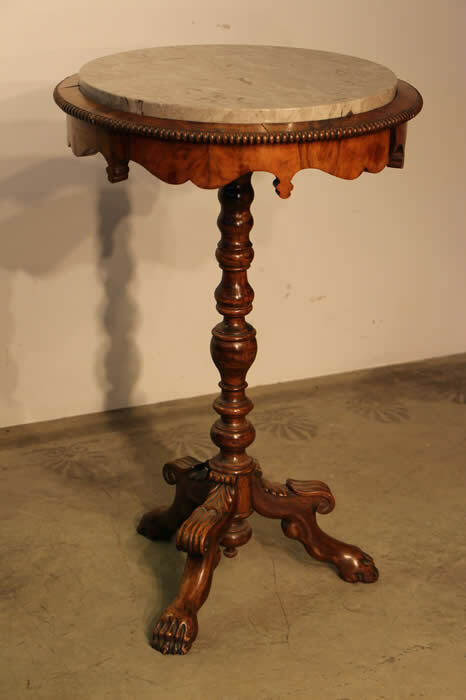 Antique solid walnut rococo stand. 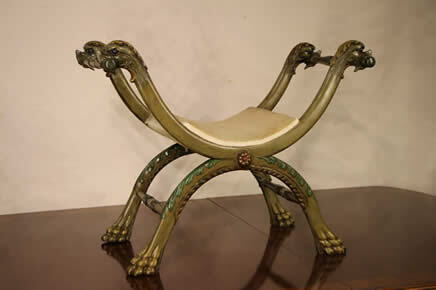 Profusely carved with ornate scrollwork cabriole legs and "x" scroll stretcher. 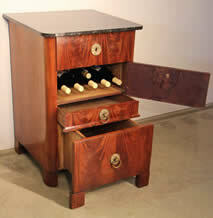 A good solid stand with a serpentine shaped top . 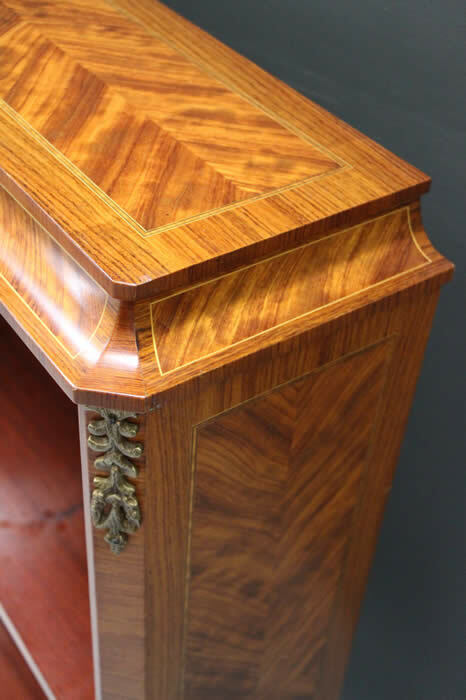 Amazing details to the carvings and all executed in pale or blonde walnut. 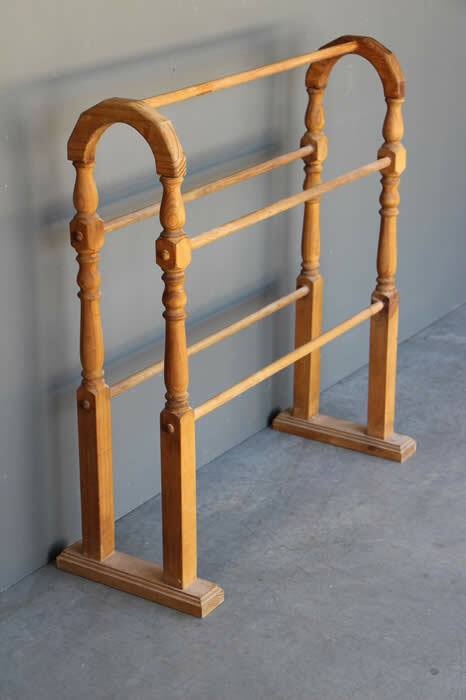 Antique Victorian style solid hand made pine towel rail drying rack with 5 rails. A curved or horse shoe shaped top with single rail joins a pair of turned columns at each end with four more racks or rails. These in turn are secured to a pair of moulded timber platform feet for extra sturdiness. 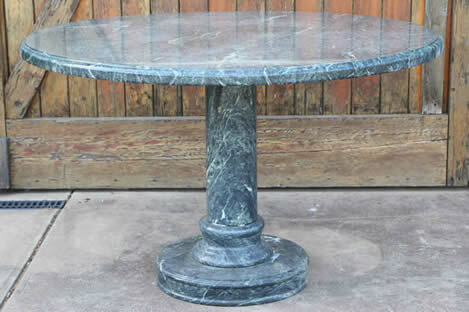 Impressive real onyx marble pedestal ornate rounded faceted sided with circular marble top in the Art Deco manner . Good polished finish and superb figuring in this hard to find semi precious stone stan. 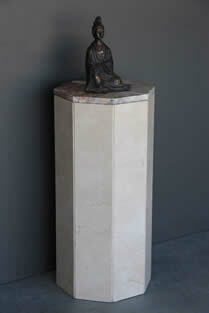 This stand is heavy and robust and would support sculpture and is ideal for statuary of candelabra. 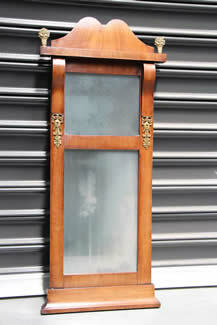 Empire mahogany mirror with tranditional carved moustache shaped top . Original patina to frame and with original silvered mirror glass- a value point as antique mirror glass was usually more expensive than the wooden frame that held them. The shaped top with bronze urn finials flanking the shaped top. A double framed mirror in mahogany and with flanking by carved empire corbells with gilt ormolu ornate mounts below. A stepped curved frame to the base finishes this gorgeous mirror well. Imagine the stories these mirrors could tell....having reflected almost 200 years of history! An French Louis XV antique style early 20th century marquetry open bookcase . 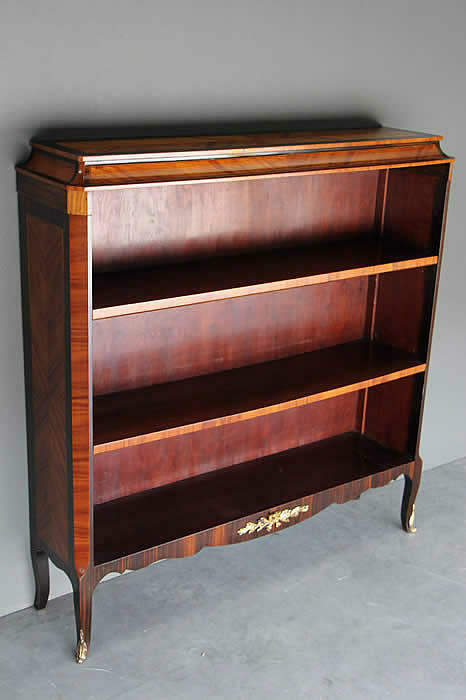 Superb ornate French marquetry in satinwood rosewood and ebony with cross banded edges and elegant curved top makes this open bookcase with ormolu mounts elegant and practical. A kingwood veneered front shelf are adjustable in height rests on brass lugs for support. 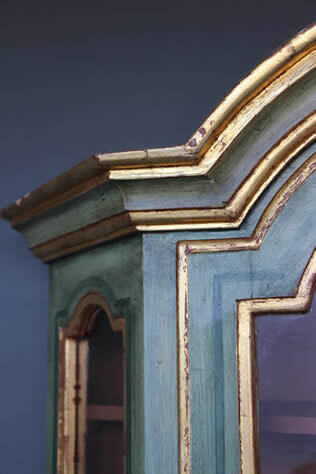 The canted corners terminate with cabriole legs and gilt bronze ormolu sabot feet. Blonde satinwood cross banding to apron with ornate bronze ormolu mount centre. Ideal for small office or hallway entrance piece as it is very narrow in depth. 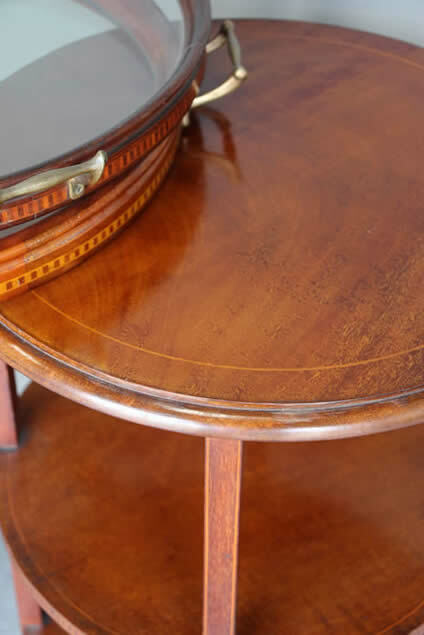 Superb quality craftsmanship and original french polished surface. 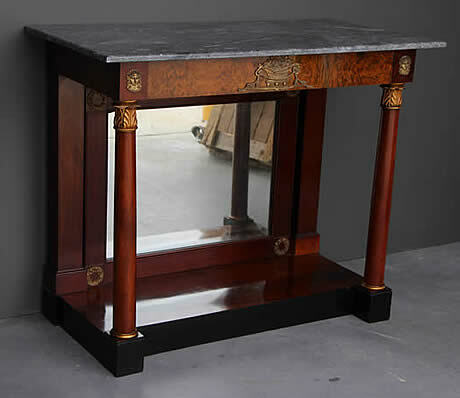 Antique flame mahogany and burl walnut French Empire console table with grey marble top . 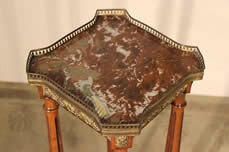 Burl walnut panels with ormolu mounts join the top frame that supports the well figured grey marble. 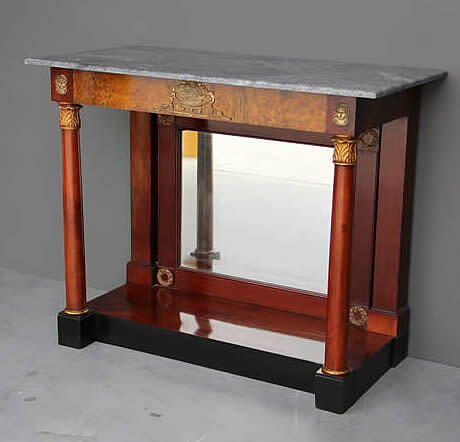 Sturdy construction in solid mahogany with separate original mirror back and turned mahogany column. Each mounted with carved and gilded capitals and bases mounted on flame mahogany and ebonised pedestal. 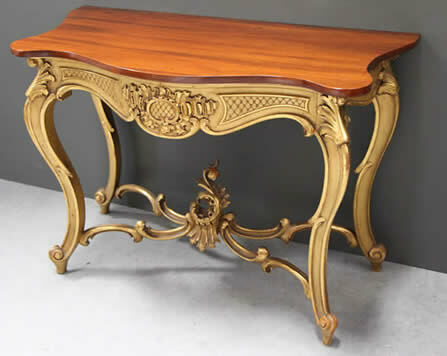 Antique French rococo carved walnut console table with french polished solid red cedar top. 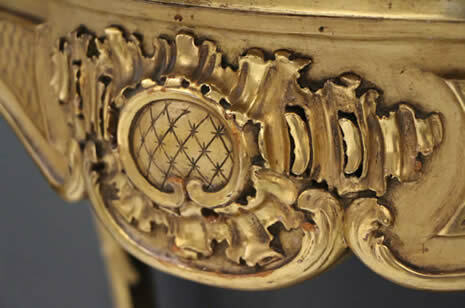 Superb quality water gilded details and satin gilding. 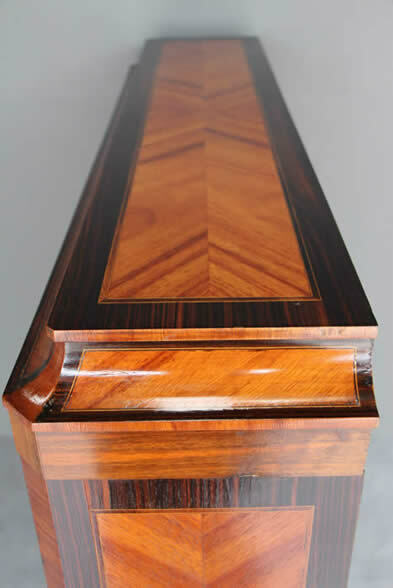 The Australian Red Cedar shaped and french polished top accentuated the gold very nicely . The cedar topp has a good overhand to the rear to accomodate deep skirting boards. 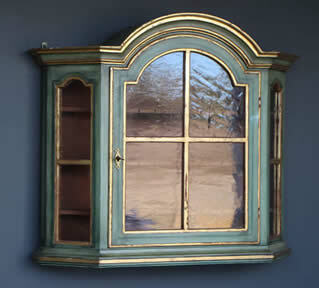 An elegant late 18th century style Gustavian wall hanging baroque cabinet painted in verdigris green with trip line work. The arched centre with a full shapped glazed door with brass escutcheon and ornate key . All glass is hand drawn and antique hand made. The door opens to reveal three fitted shelves with plate and spoon rack cutouts. ( silver not supplied). The cabinet hangs from a wall with two steel lugs. A lovely moss green painted finish and with gold water gilt gold leaf gilt edging completes this wonderful practical piece of furniture. 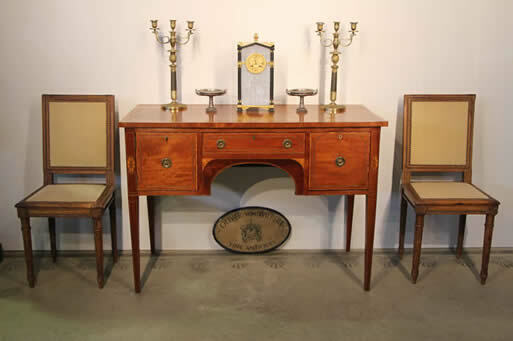 Swedish late 18th century style made in the mid 20th century. 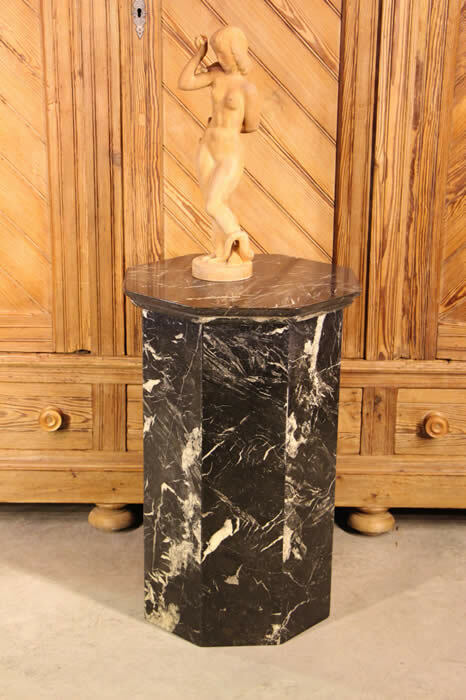 Impressive real marble pedestal 8 sided with rouge marble top in the Art Deco manner . Substantial construction to hold heavy weight sculpture this marvelous robust stand is ideal for statuary of candelabra. point to point 37cm across. 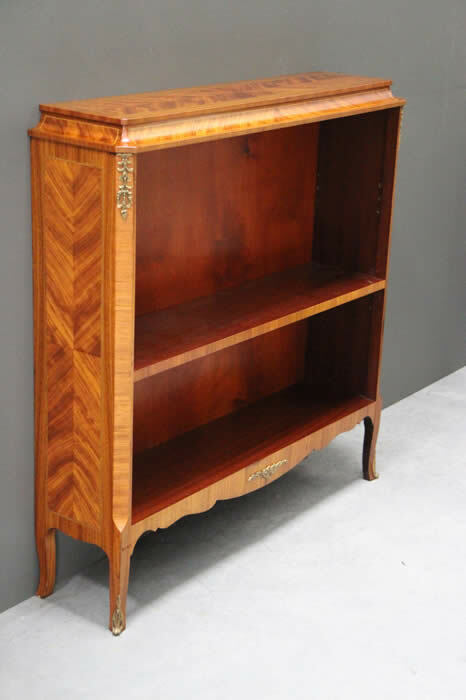 An antique early 20th century marquetry display case, open bookcase in the French Louis manner. 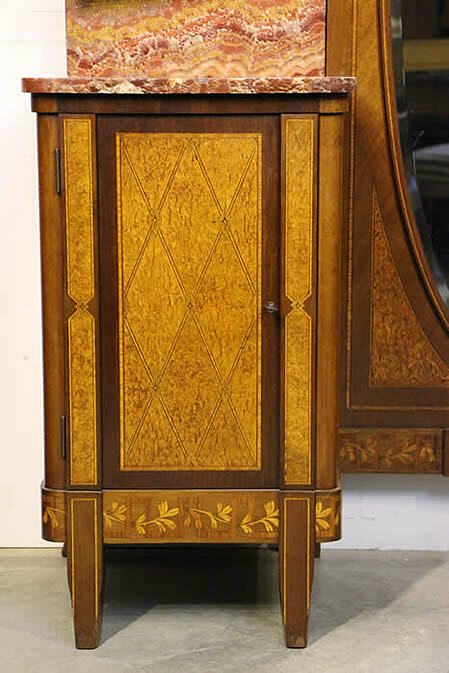 Superb ornate French marquetry in kingwood, rosewood and ebony with cross banded edges and elegant curved top makes this open bookcase with gilt ormolu mounts elegant and unique. 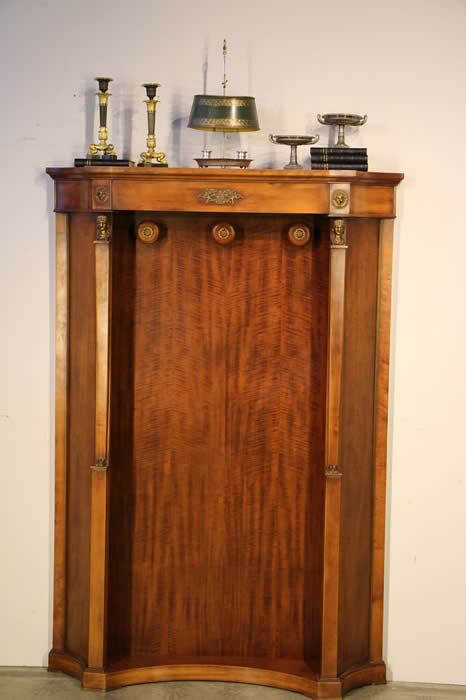 Two kingwood veneered front shelves are adjustable in height and rest on brass lugs for support. 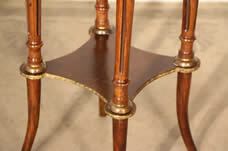 the canted corners terminate with cabriole legs and gilt bronze ormoly sabot feet. 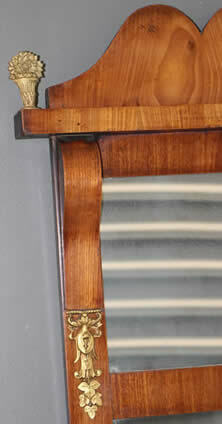 Brazillian rosewood cross banding to apron with ornate gilt bronze ormolu mount centre. ideal for small office or hallway entrance piece. Superb quality craftsmanship and polished top. 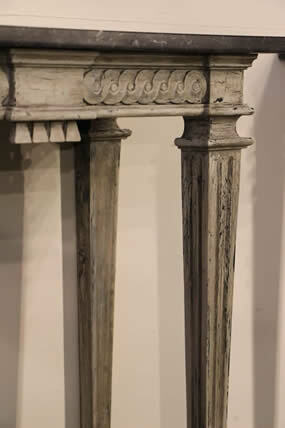 Title Swedish Gustavian antique painted pine pedestal stand with antique painted finish. 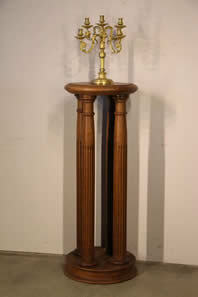 Antique solid pine architectural column pedestal or sculpture stand. The rectangular shaped top sits on a framed four side panel column with stepped base. 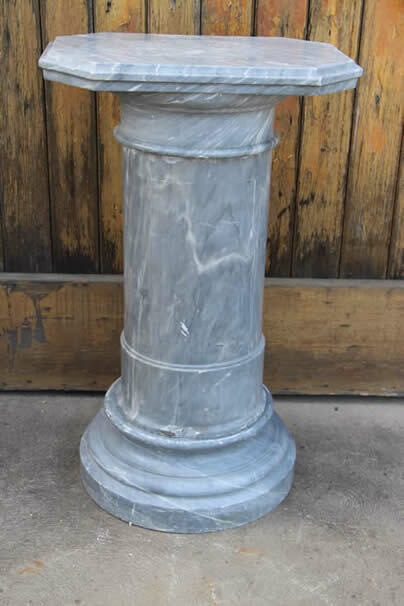 A rarity for any neoclassical interior, this pedestal still retains its original Swedish country painted finish and has nice original patina, unrestored and in very good condition for its age. It would suit uses such as a stand for a marble sculpture, clock or an impressive candelabra lamp. 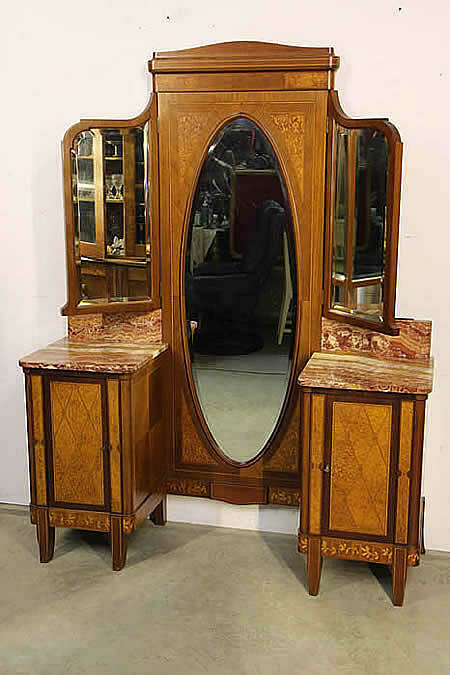 A gorgeous antique French Art Deco marquetry dressing table. The combination of cheval mirror with hinged mirrors to each side and a pair of marble topped lockable chests to store your expensive silks or other treasures. 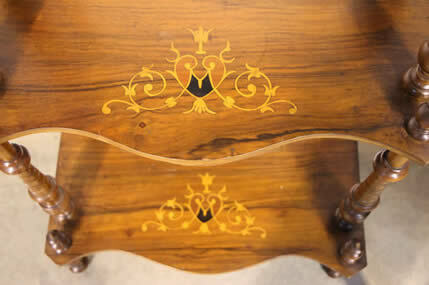 Ornate inlay in amboyna, satinwood, rosewood and mahogany are just superb. The side cabinets with original rouge marble tops. Each side cabinet with inlaid doors with working locks and 2 keys supplied. 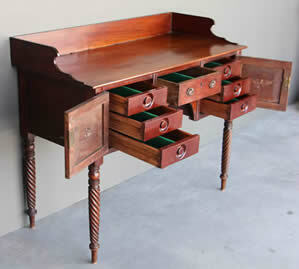 The front hinges open to reveal four mahogany internal drawers. All original mirrors with ornate bevelled edges ,hand ground to precision. 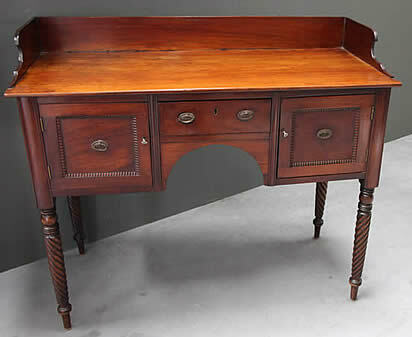 A superb quality dressing table for the most affluent interior. 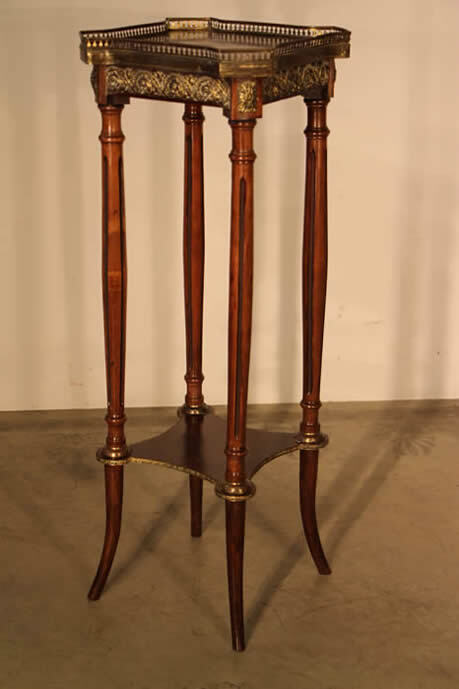 Antique solid walnut wotnot stand of four shelves joined by turned walnut columns, legs and finials. Each graduated size shelf with marquetry inlay in ebony satinwood and fruitwoods with matching bow front shaped aprons and matching inlays. This example is unusually tall and practical for hallway, dining room or whatever use....hence the name for this type of furniture is a Wotnot. Nice original patina, unrestored and in very good condition for its age. 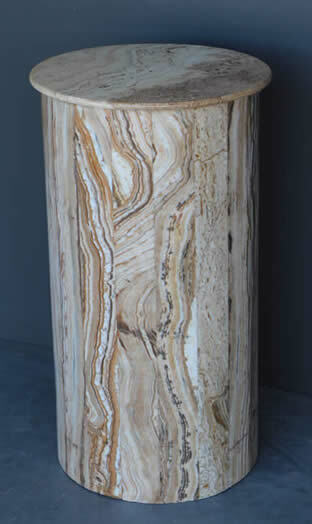 a traditional pedestal circular base , a massive turned column centre and a stepped turned top with rectangular shaped top, all carved from one massive marble piece. The top has been repaired at some time but could easily be mended properly or covered with a separate facia slab of marble. Yes this marble has seen some use but still holds its weight well. 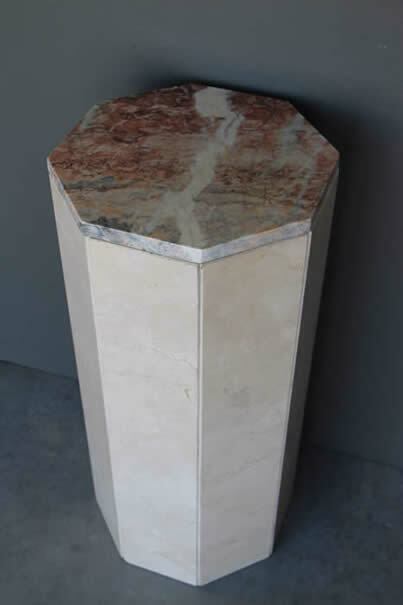 This marble pedestal would date from the early to mid 1800's and would have supported a considerable weight , possibly even a marble statue of great importance. 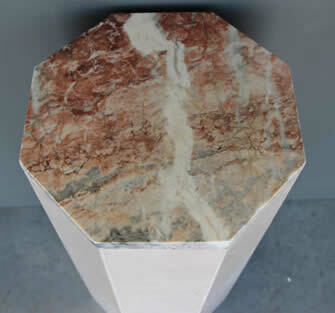 the three sections are: turned base height 17cm , column centre height 53 cm, turned and rectangular top height 15cm . Would be perfect for an outdoor table base on the patio! 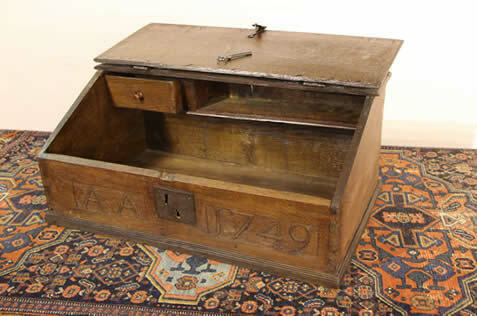 A very well carved adn turned solid oak coulmn stand. 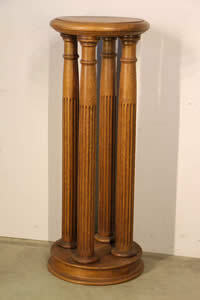 The tall four pillar turned and fluted columns firmly mounted onto a massive oak pedestal base. 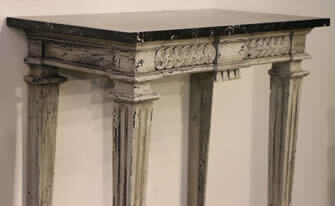 The elegant columns tapering inwards in the classic orders with turned rings and capitals. 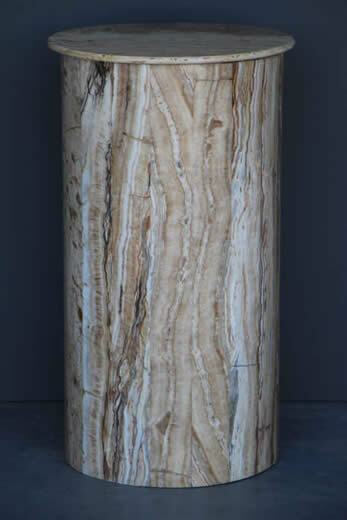 the massive oak turned top is 6 cm thick and has a flat top to support a statue up to 43 cm in diameter. Pedestals of such a grand scale and exquisite proportions would have to have been made with a high degree of skill and cost. Quite possibly forn elaborate manner house or castle , perhaps even a private museum? 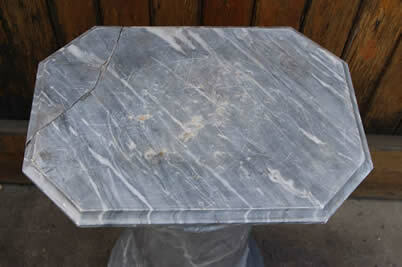 A n unusually solid Italian antico verdi marble dining table . 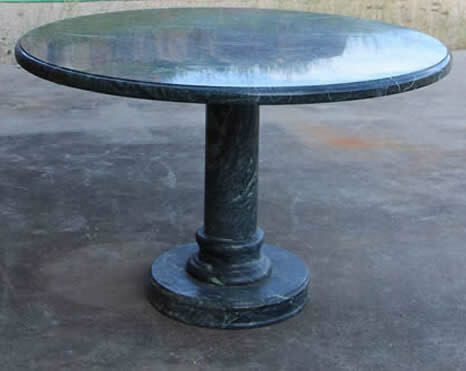 the massive 4 cm thick top resting on a solid turned green marble column base to match. in very good condition with no cracks no repairs. Would seat 6 -7 comfortably or 8 at a squeeze. Note the average dining table length per person should be at least 50 cm wide. 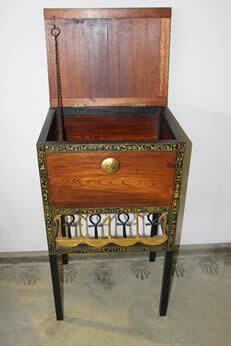 A Unique and unusual chest on stand, made of Australian red cedar and ebonised and parcel gilding. The ebonised cedar frame hand painted with exact hierogliphics as found during the excavations of the Pharao's tomb. A unique piece of history made by a master craftsman. 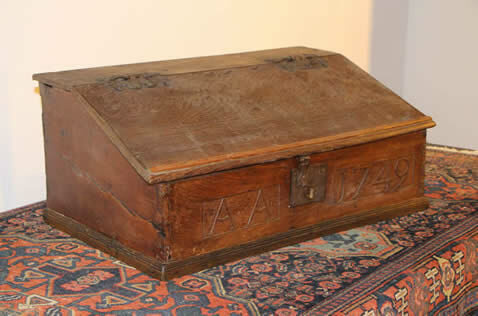 The top lift lid with gilded handles , These were originally intended to be tied and sealed with the Pharaohs seal for closure. Note the fine cast ankh fretwork below the case. 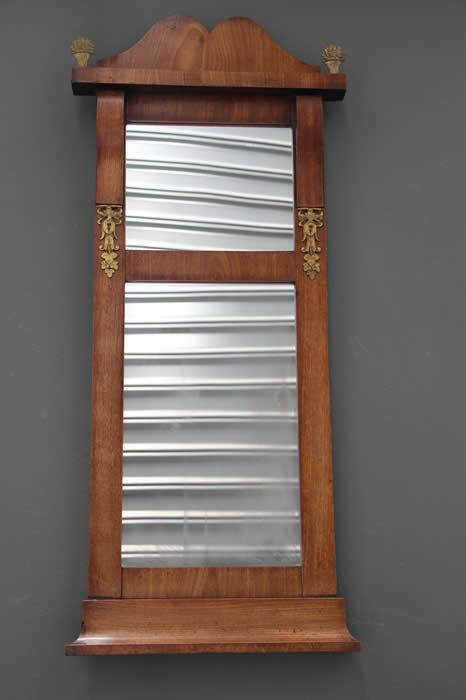 A Swedish style satinwood and ebonised French Empire fire screen . Raised on outswept legs the cloth covered screen glides up and down within the supporting turned satinwood columns, joined by a ebonised turned stretcher . 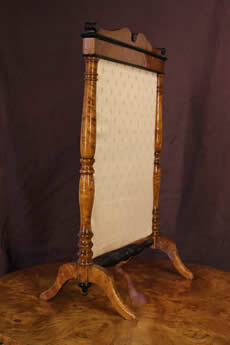 the top of the screen with ornate moustache shaped pelmet with ebonized biedermeier style details. Screens can be changed easily with alternative fabic, LED tv screens or over a mirror! 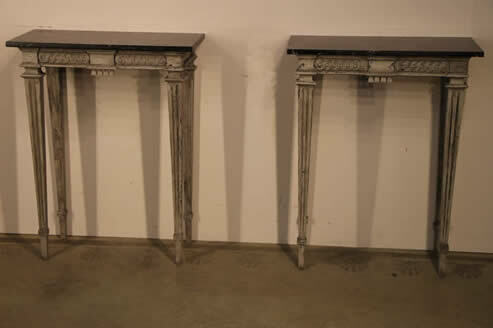 Antique pair of well carved marble top hall or console tables in the Gustavian manner. Raised on elegant tall tapering fluted legs and with fossil marble tops, these frames are very heavy and sturdy and do not require fixing to a wall. 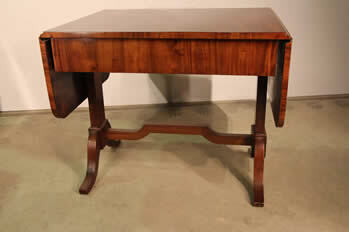 It is very unusual to find such well proportioned hall tables and even rarer that they are a pair. 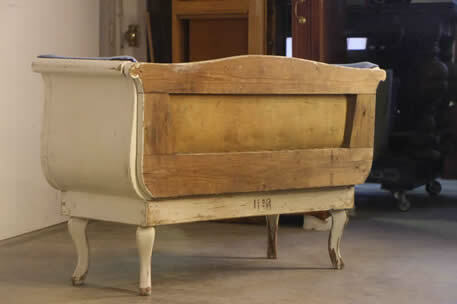 The Swedish Gustavian style takes its design influence from the neoclassical French Louis XVI period. 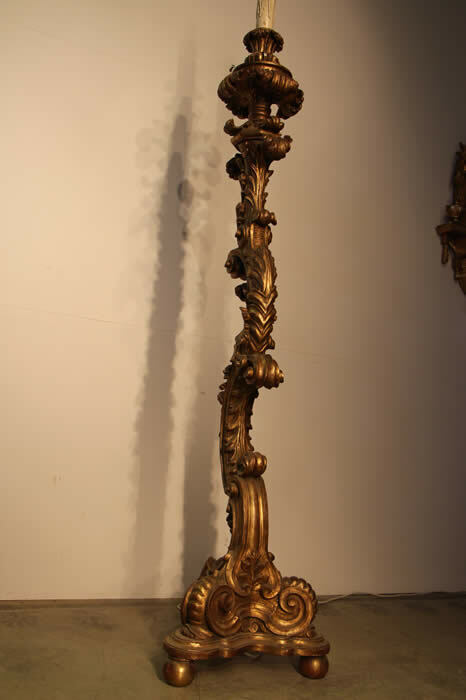 A beautiful well carved Italian torchere or candelabra stand of superb proportions. 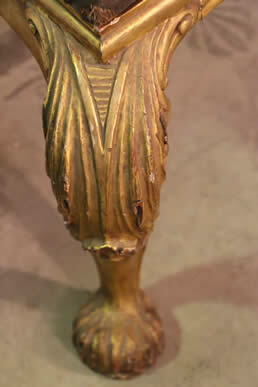 This unique piece is very well carved from solid wood and still retains its original gold leaf 19th century finish . It has been electrified at a later date. Provenance: purchased from the importer : Bunda antiques in the 1970's thence Werrington House. 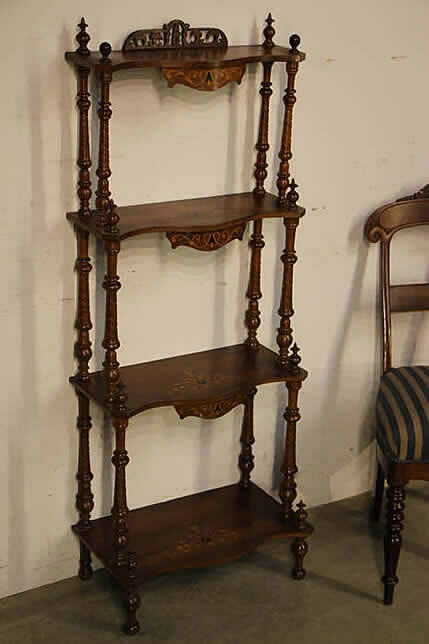 French Charles X servery etagere. wotnot, with marble top in the Empire Style. Fitted full length single drawer to front flame mahogany on oak. Two extension slides at each side just below the top make this a very practical piece of furniture. 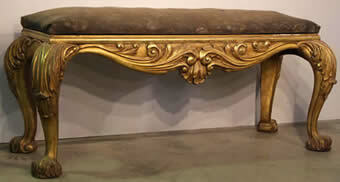 A Superbly carved and water gilt, using real gold leaf rococo window seat in the manner of William Kent. 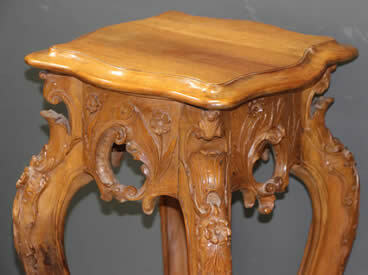 A well carved Italian walnut X frame stool in the Rennaissance manner. The dolphin of serpents heads holding a carved ornate handle and scrolling down to acanthus covered legs terminating in lions paw feet. 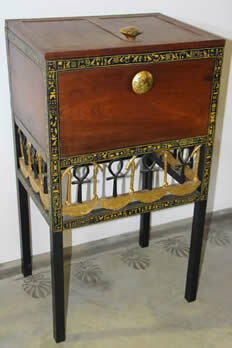 The later polychrome Venetial style hand painted finish with polished surface. The vintage beige velvet saddle seat with braided edge is perfect for holding aloft your favourite leopard skin cushion with gilt tassles. 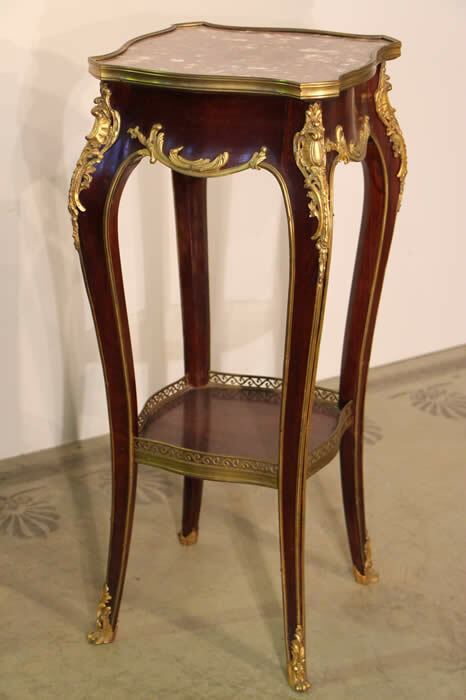 French Empire style hall stand with solid top and ormolu mounts. Gorgeous design with curved brass molded sides and caryatid bronze mounts and well figured veneer back. The three turned coat hooks with brass details. 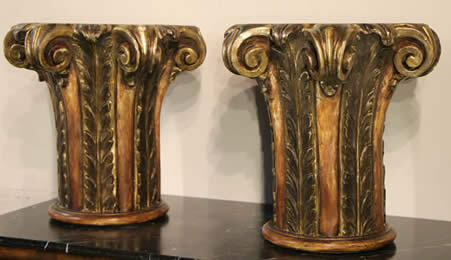 Retour d'Egypt bronze mounts and well polished surface in the Empire style and or narrow depth proportions. 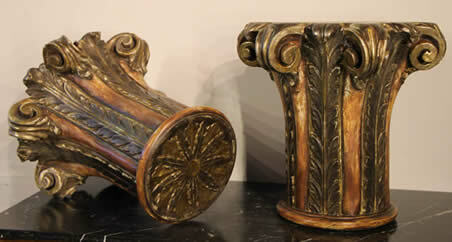 Pair of heavy full timber Coninthian style capitals carved and silver gilt in the venetian style of the 18th century. Lovely patina and finish. Perfect as use for stylish lamp tables or decore design statments. the bases have been finished with a carved rozette and the diameter measures 26cm unlike the tops which measure 48 cm diameter and are unfinished. 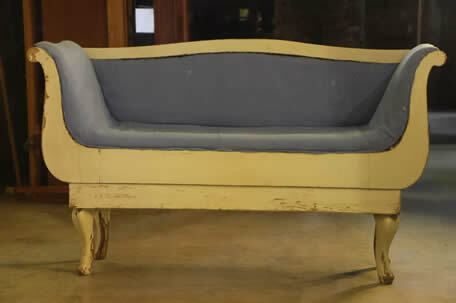 A Swedish painted pine Childrens sofa of the karl Johan period with roll over armrests and shaped backrest. The whole raised on carved Biedermeier legs. White painted finish appears original to the piece. The upholstery covering is more modern and in hand stitched blue cotton clock. The original upholstery fabric appears to still be underneath this later blue cloth. The back and from underneath indicates the original horsehair wadding is still all there. On the back of the dovetail fitted plinth is the inscription No-11. 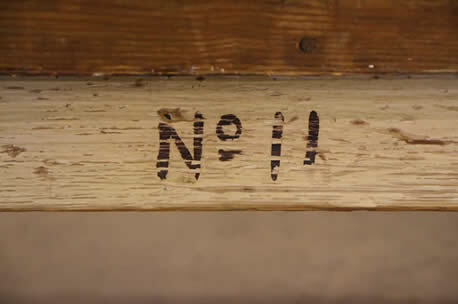 This may be a room inventory mark to indicate where it belonged in some Swedish country summer house?? In very original order and perfect for teddy and friends. 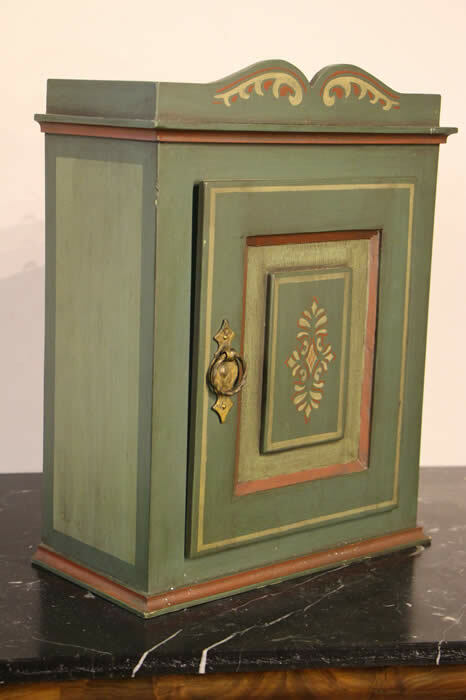 A lovely Alpine style spice cabinet with rustic painted design using ochre, rouge and green tones. The single door below a shaped top French tstyle pelmet. The good with hand wrought iron handle and ring pull. Inside there is a single fixed shelf. 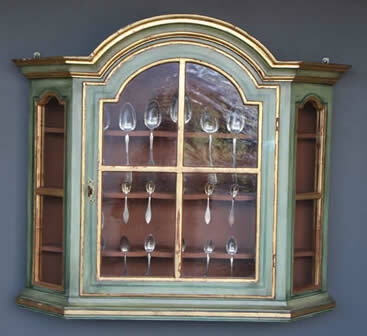 A trasure cabinet that is perfect for hanging up high away from prying childrens hands. 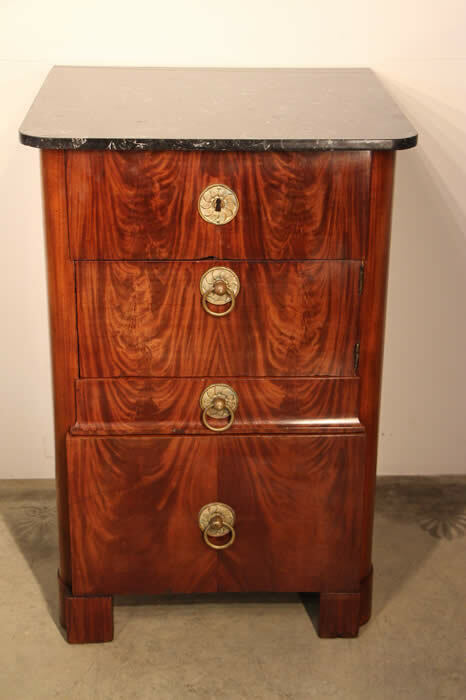 A rare faded flame mahogany wine cellarette with marble top and lots of secret space within. 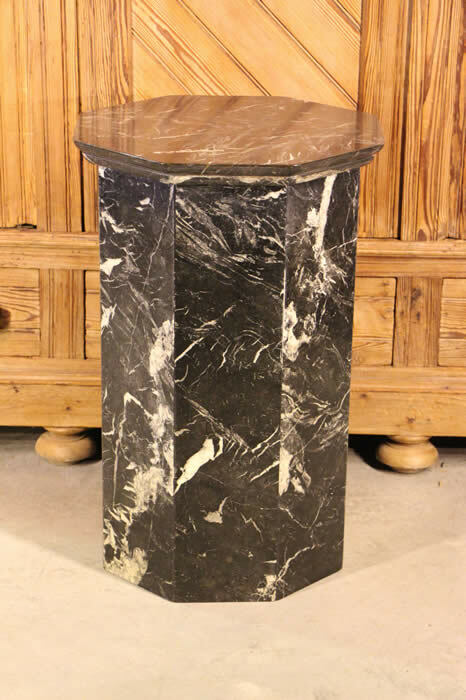 The fossil black marble top hides a space for several layers of wine bottles beneath it. A single door compartment below that will take two further layers of bottles etc. 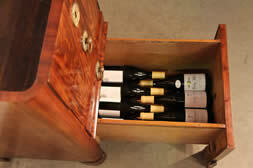 Below that is an elegantly shaped front drawer ideal for corkscrew collections and below this is a large robust drawer with stepped front legs attached hiding bras roller castors within to easily manage the weight of many bottles. 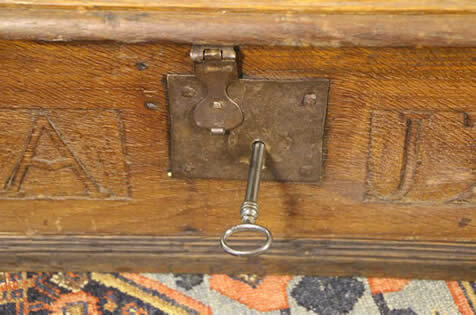 Original gilt brass handles and escutcheon all of the period. 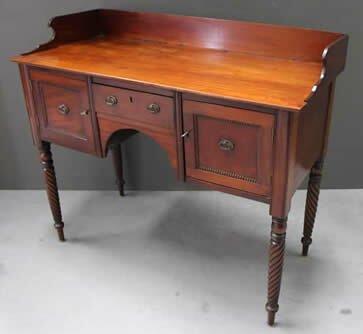 Good sized English Georgian period sideboard in mahogany with fine Sheraton inlays. Satinwood and ebony stringing and brass handles and locks. complete with key. 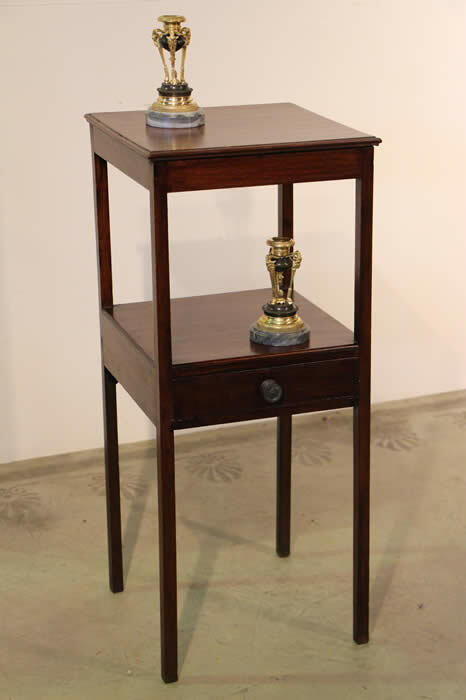 A square English Georgian pedestal stand or table, originally used as a wash stand, this utilitarian piece of antique furniture is ideal as a hall table or bedside table. Fitted with a lower shelf and with single brass handled drawer and raised on four elegant slender legs. A beautiful well carved side table , lamp table with circular marble top inlaid into cross banded frame with carved edge in the gothic revival manner. 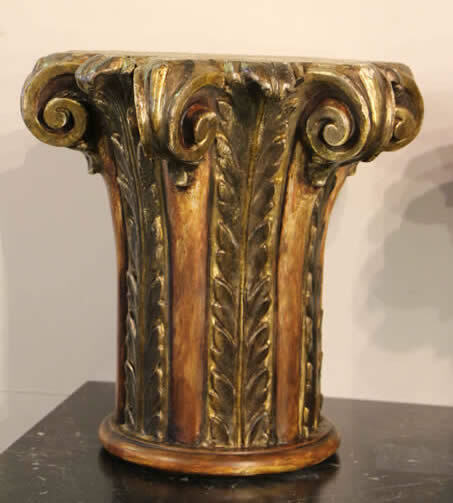 The whole raised on an elegant turned central column supported by well carved tripod lions paw feet, reminescent of Ancient Roman bronze furniture excavated at Herculanium. 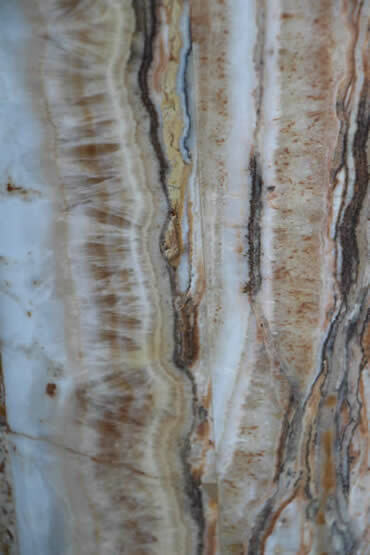 Mottled marble top in perfect condition, no chips, cracks or repairs . 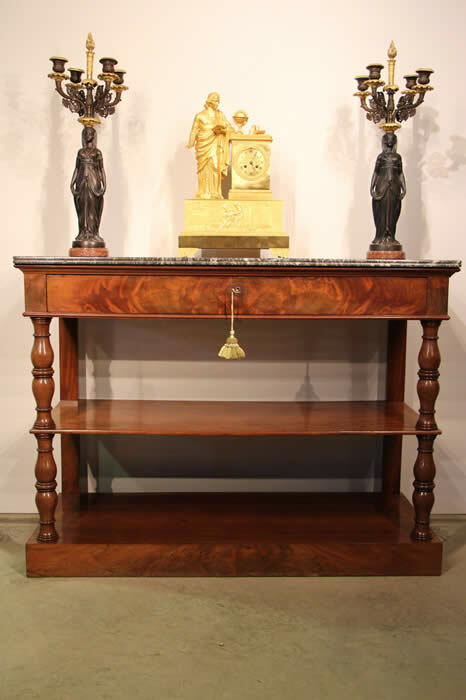 A beautiful French fruitwood pedestal stand in the Louis XVI manner. 19th century with gilt ormolu gallery, pierced acanthus scrollwork and cabouchons . The marble top is supported by four turned and carved columns terminating with ormolu column bases onto the lower platform base. This is then supported by four out swept tapering legs. Superb quality gilt bronze ormolu mounted marquetry stand with shaped rouge marble top and brass gallery. 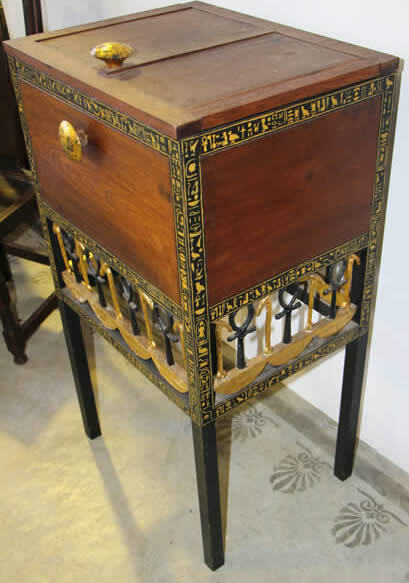 Raised on four shaped cabriole legs and with shaped lower shelf adorned with radiating veneer pattern and surrounded with pierced brass gallery. 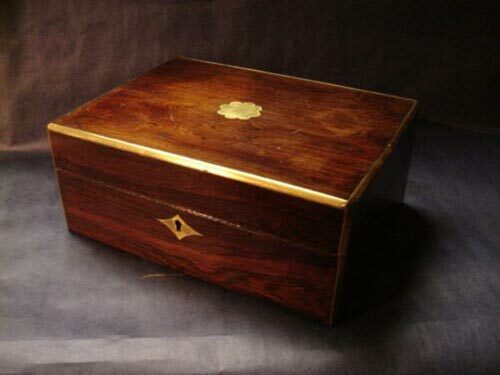 Description Brazillian rosewood document box with brass inlays. Late regency period with red interior remnant.